Dear NASA, I love you, but come on... monkey radiation tests? What is this? The '50s? Are you going to resuscitate J. Edgar Hoover next? Didn't you guys see Matthew Broderick and Helen Hunt saving the monkeys in Project X? That's what NASA is planning to do: use squirrel monkeys to test the possible effect of radiation in humans for long-term space missions. 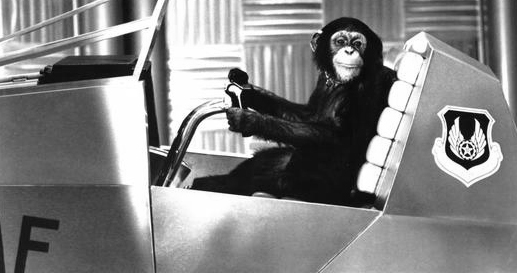 This is the first time the agency is going to test with monkeys since the days of the Mercury Project. They plan to bomb 27 squirrel monkeys with high-energy gamma-ray radiation, the equivalent of what astronauts could get in a three-year voyage. This obviously can result in two things: monkeys dying in pain or giant green monkeys destroying the whole East Coast. NASA-funded research has shown that simulated space radiation can affect nerve cells in culture and also the behaviour of mice and rats, but these studies are limited in the extent they can be extrapolated to human behaviour and performance. Studies in nonhuman primates are essential to be able to best predict neurobehavioral effects of radiation on humans.